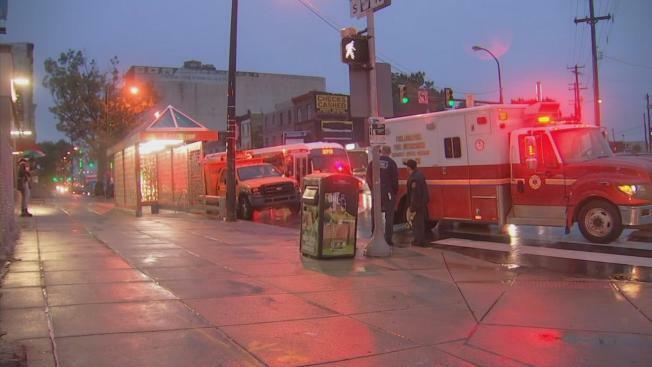 The boy was at the North Philadelphia train station on North Broad Street and Allegheny Avenue at 5:55 p.m. Sunday when he fell between two cars on the Broad Street Line. An investigation is underway after a 7-year-old boy who was selling candy on a subway train fell on the tracks and was struck and killed. Witnesses are speaking out. UPDATE: The National Transportation Safety Board is investigating. Details here. A 7-year-old boy who was selling candy on a subway train on SEPTA's Broad Street line died after he fell on the tracks in North Philadelphia while the train was moving. The boy, his 11-year-old brother and a 26-year-old man were selling candy on a SEPTA subway train traveling between the Allegheny and Lehigh stations Sunday at 5:45 p.m., police said. As the 7-year-old boy walked between two train cars, he fell between them and landed on the tracks below. The operator stopped the train at the Lehigh station after being notified of the incident. The boy was pronounced dead at 6:04 p.m.
"His brother came back and was crying," a passenger, who did not want to be identified, told NBC10. "He grabbed my hand and nothing could be said." Officials say the man who was with the boys on the train is not their father but their parents have been notified. The boy's older brother was taken off the train by police. SEPTA Police Chief Thomas Nestel called the death "a horrible, horrible thing." He said police are also conducting a routine sudden death investigation. Names of those involved haven't been released. Nestel said SEPTA's message was that "the walkway between train cars is not a safe passageway for people to use" while the train is moving. Service on the Broad Street line was delayed in both directions between Erie and Girard avenues due to the incident. Regular train service later resumed.